Trek 2000 Corporation remains in partnership with what used to be Big Centre TV and is now Made in Birmingham. This is a new development and more news will follow. Our local TVTruck studio has suffered a great loss in that our partner Rob Wurzer passed away on November 4, 2016 and Rob will be missed. Made in Birmingham, the new, dedicated television channel for the West Midlands has unveiled its launch line-up of programming, ahead of going live at 6pm this evening - Tuesday 8 November, 2016. Made in Birmingham’s inaugural show will be the live, home-grown city news programme, ‘#BirminghamNews’. The show will be presented by local news anchor, Mike Prince featuring the biggest stories to get the West Midlands talking, every weekday at 6pm and 9pm. #BirminghamNews will be followed by Made in Birmingham’s nightly magazine show, ‘The Lowdown Birmingham’. Local residents, George Hancorn, Taffy Mushipe and Richard Gullick will bring the latest music and events, culture and activities to viewers across the region, every weekday evening at 6.30pm and 9.30pm. Made in Birmingham’s programme schedule will comprise an eclectic mix of factual, news, entertainment and lifestyle programming. Locally produced content will be blended with shared programmes produced across the Made Television network and acquired shows. These include Sarah Beeny’s ‘Double Your House for Half Your Money’ and Dawn O’Porter’s ‘This Old Thing’. Other original, local programming will include veteran DJ Tom Ross’ Goalzone; where viewers get involved in live and lively weekly football debate. Jamie Conway, CEO of Made Television, says: ‘The West Midlands is a vibrant and exciting region and a great platform for creating programming that will inspire and engage our viewers. We’re looking forward to unveiling some of our new shows for the first time this evening. Trek 2000 Corporation has recently invested in the formation of Big Centre TV, in Birmingham England, along with their good friend and long time business partner Mike Prince and two other investors. As part of the investment, Gordon Haddock has become a director. Maureen and Gord Haddock, along with Rob Wurzer, who is their good friend and business partner in TVTruck, were delighted to visit Big Centre in September of 2015. 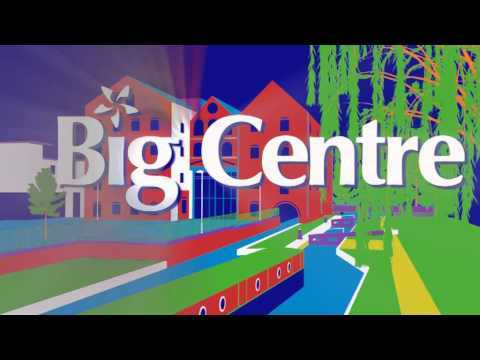 Mike Prince and the team at Big Centre TV have the capability to produce programmes which will not only be interesting to the people of the West Midlands but to English speaking countries across the globe. Maureen is delighted that Big Centre TV is located in the same building as a media school. It is natural that a symbiotic working relationship will ensue. TVTruck, here in Saskatoon, SK, will offer creative support when it is fitting, and partner Rob Wurzer brings a wide range of experience and talents to the Canadian mix. Maureen was interviewed by Monica Price of Cuppa TV in September 2015 while visiting Birmingham, and it is hoped that Monica will visit TVTruck to do some Canadian content interviews in the new year. Maureen refers those who show interest in Get a Bigger Wagon to this interview, regularly. Monica covered an amazing amount of content in a brief time! Friends and partners for well over a decade! Michael Prince, one of the creative developers for Big Centre TV, has been friends with Gordon Haddock for fifteen years and they are delighted to be able to work together, albeight from across the pond, on the exciting Big Centre TV project! TVTruck preparing for a Saskatchewan Roughrider broadcast. Rob Wurzer of TVTruck has a perch high above the crowd to catch the Saskatchewan Roughrider action from overhead. Always time for tea or coffee! These mugs are given as prizes from Big Centre TV in Birmingham, England. Rob Wurzer, partner in TVTruck, was pleased to receive a Big Centre Mug for his desk at TVTruck, here in Saskatoon, SK. The Haddocks and partner Rob Wurzer enjoyed a day at the Walsall Football Club. They were given an amazing noon meal, a tour of the facilities, including the training room, and front row seats to an exhilarating football match. Go Saddlers! Maureen and Gord have always started businesses with a no frills approach. It was fun to see the team at Big Centre line up to make a cup of tea in such a tiny space. In other small spaces, laptop computers line table tops and people work, elbow to elbow, creating content and making appointments. Apparently, the tables are a big improvement. There was a time when they worked, sitting on the floor, in an even smaller space. Hopefully, someone has taken photos as the journey continues. We totally enjoyed our time at the Walsall Football Club. Big Centre TV sponsored the match and we were treated royally. Rob, GOrd, and Maureen were happy to present a Roughrider Flag to the Walsall club.